Traditional villa with pool, situated in the exclusive area of Escubells. The villa is approx. 2 km before Escubells. This reformed coutry house is a mixture of old and new, some of the original outside walls are nearly 1m thick in contrast to the newer walls at the front of the villa. From the attractive parking area with weeping willow and the flowers a few steps lead to the pool terrace and villa. The entrance to the villa is through a large glass door into the open plan living/dining area and bar style kitchen with serving hatch. The bedrooms are accessed from the living area. One twin bedroom on the right has a full en suite shower room while the other 2 twin bedrooms are one step up from the living room. There is a full shower room with double wash hand basin between them. Outside, the terrace and pool offer shady and sunny areas and tucked around the corner of the villa is a built in BBQ with separate dining facilities. The rugged coastline of Cap des Falco and the island of Formentera ( weather permitting) can be seen from the terrace. Hair dryer supplied. Please remember like most rural villas in Spain the drainage from bath and toilets is into a septic tank, to help prevent drainage smells we request only natural products be used. Basic kitchen but adequate for holiday home. The house was complete, clean and the location was central! Carmen and her parents were so friendly! Great value for a great villa! A very spacious clean house with a nice view! It's very quiet at night for a good night sleep. Beds are fine and comfy, clean bathroom and kitchen. We are def. coming back! We had a wonderful week in Carmen's house. The house is very well located, with lots of nature around and very quiet but still close enough to Ibiza town and the nice beaches. Carmen was a terrific host. We'd like to come again! We loved Carmen's house and hospitality ! 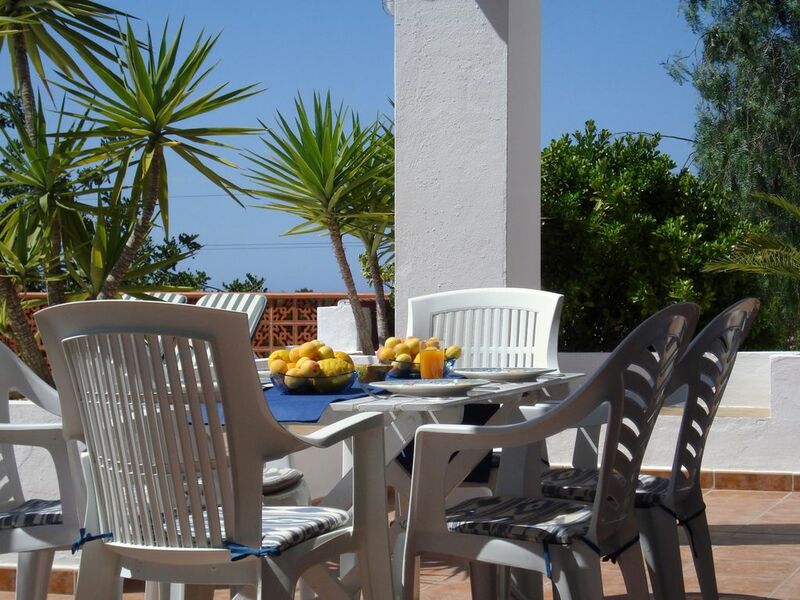 The house is ideally located, very well furnished, with a wonderfull terrace with a view on the swimming pool and the sea. Carmen is very helpful. We loved our stay, we warmly recommend and hope we'll come back ! This villa is in a beautiful and peaceful location, offering excellent value for money. On arrival we were greeted by Carmen, the wonderful owner, she really contributes to making this a special place to stay and will do anything she can to help. The villa is kept spotlessly clean, is well equipped and has stunning views. A selection of drinks, fruit and breakfast items on check in was a very nice gesture. We will definitely be returning! I wish you were here again!!!! To secure a booking 25% if more than 90 days before arrival, a further 25% due 90 days before arrival by bank transfer. The remaining balance with security deposit of 500 € in cash on arrival.